Interop 2015: Cookies, T-Shirts, and Collaboration! 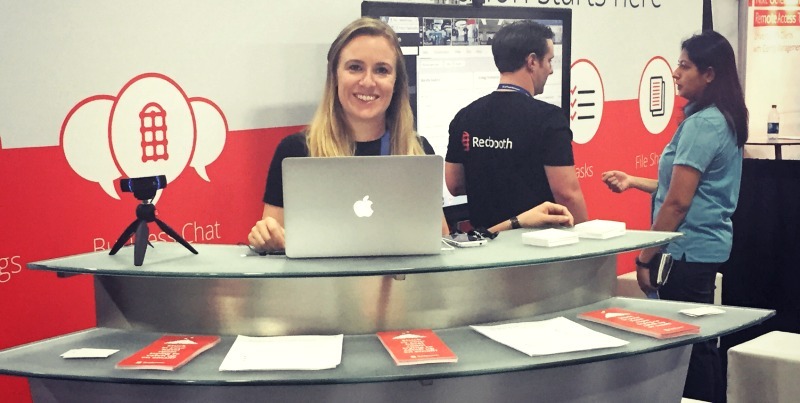 Charles Studt, Redbooth’s VP of Marketing, and Samantha Oznowicz, from Redbooth’s Customer Success team, sat down to reflect on being part of Interop Las Vegas 2015. Charles: It was our pleasure — and our honor — to sponsor the Collaboration track this year at Interop. We were thrilled to be able to support the way that Unified Communications & Collaboration is evolving as a field: coming to see collaboration software as a truly integral part of the IT landscape. Samantha: This was my first year at Interop, and it was great. We were talking to people all day, every day. It was terrific to hear about their experiences, what they’re using now, and what they’re looking for. Charles: It was fantastic to have Customer Success, Sales, and Marketing all represented at the booth and speaking with Interop attendees. We had a ton of traffic, so we needed all hands on deck: VP of Sales Jeff Koll, Josh Ireland and Thomas Koerner from our Sales team, and Redbooth Chief Evangelist David F. Carr were staying busy! Samantha: And of course we had fresh-baked chocolate chip cookies from 2-4pm every day. They were a perfect way to welcome people who stopped by to learn more about Redbooth. And the shirts! They went so fast. We were out of the shirts on the first day. People were even taking them for their children. It was amazing. Charles: What the shirts say — “work smarter” — is true! Redbooth is all about working smarter. We’re passionate about helping companies recover lost productivity and get back time that their employees are spending in email. Samantha: The people we talked to want to get that productivity back, but it’s very challenging with their current tools. Even if they’re using an enterprise collaboration tool, they still have to use something else for video conferencing, something else for emails, and so on. Charles: Really, if we had a Redbooth t-shirt for every person who told us that their current solution was driving them crazy, we would’ve had enough shirts to last all three days! Charles: The people we talked to were glad to hear that they could continue to get value out of their current IT infrastructure. Redbooth “plays well with others,” as we often say, and integrates with many of the most popular applications that our customers use. This way, they can make the most of what they have. Samantha: We’ve found that continuing to use your current infrastructure actually accelerates company-wide adoption of Redbooth, since it gives people some familiar context. Charles: That company-wide adoption really is key for customers who want to see productivity gains right away. Samantha: Actually, that’s why we offered each person we talked to at Interop a special opportunity: sign up for a free 30-day trial, and get a complimentary “flash training” session for your team to onboard them faster and get the most out of their trial. Charles: Speaking of helping our customers to be successful, we got to catch up with with some current Redbooth users at Interop and heard some great reports! We love to hear that Redbooth is making a difference in how people work and helping them to get back hours in their day. Samantha: You know, I loved getting to connect in person with our customers. It was one of my very favorite parts of Interop. Charles: Fortunately for everyone who couldn’t make it to Interop this year, we’re bringing a little bit of it directly to them! David F. Carr, our Chief Evangelist, gave a great talk on 10 Keys to Collaboration for the Agile Enterprise. We’re showcasing his top points in an upcoming live webcast. Samantha: Really, the whole week was a great experience. Charles: Many thanks to UBM and Interop, who did an excellent job organizing the whole event. We were very happy to be a part of it…even the folks back in the office. Samantha: That’s right! We had the team set up for a giant video conference on our big monitor. That way, people walking by could see how our HD Meetings worked — and even wave at folks from our offices. Charles: And meanwhile, everyone in the offices could get a sense of the energy on the floor at Interop. A perfect way to use HD meetings! Do you want to take Redbooth for a test drive? If you missed Interop 2015, you can do it right from your own computer. Just sign up for a free 30-day trial, no credit card required.